After over a decade of war, do only the blast walls, concrete and sandbags hold the memories of those killed? It is a quiet, wintry day in Herat, and the sons of Haji Sultan Hamidy are busy at work. There’s banter and cups of tea, visitors popping into Hamidy’s store to say hello, and a young helper is told to dust off the most familiar item in the store: hand blown glass. There are piles of it, heaped up in boxes and on shelves, molded into cups and goblets, jars and tumblers. The aquamarine colors come to life as the dust is cleaned off. Khalid Hamidy, Haji Sultan Hamidy’s son, is all smiles and hellos, as he tosses a box of hand blown glass items into the air to show off how well it’s packed. The elder Hamidy isn’t in the store on this day, having traveled to India for medical treatment. But his sons are continuing the family trade in his absence, taking pride in the traditions associated with it that are now being forgotten. 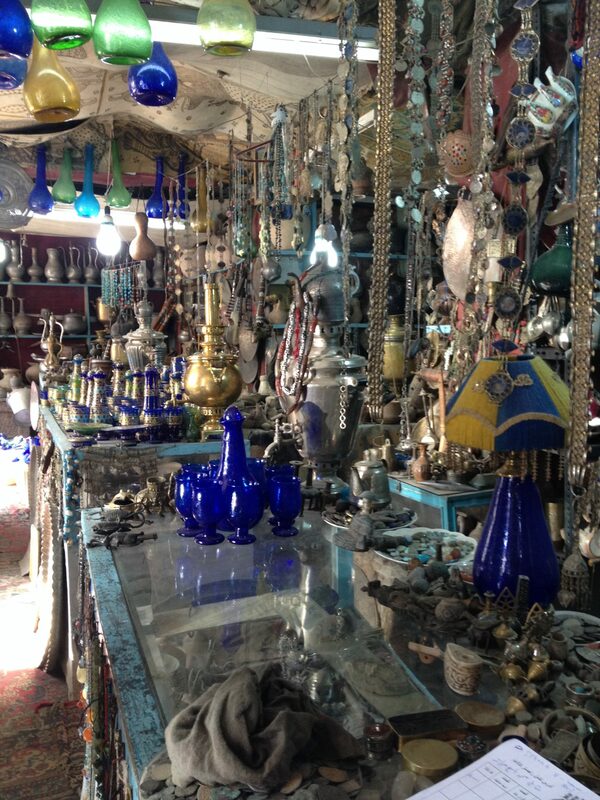 For seventy years, Haji Sultan Hamidy and his family have been making hand blown glass objects. Generations of Hamidy’s family, his son Khalid Hamidy says, have taken up the work. As an insurgency movement against the Communist government and Russian troops engulfed the country in the 1980s, Hamidy decided to dedicate the glasses to the memories of those fallen in war. This quiet act of remembering the dead found its way to the bereaved families. “The major commanders would often come and they would take these glasses to the families whose sons had died,” Hamidy’s son, Khalid, told me when I visited the store in December. “It is an amazing thing that this glass is all over Afghanistan now,” he said, comparing it to a national tradition of sorts. But he admits that this ritual no longer exists. “That was the last big order,” he says. Hand-blown glass at the Hamidy’s store in Herat. Photo by Saba Imtiaz. All rights reserved. The Hamidy family’s remembrances of an earlier conflict in Afghanistan stand in stark parallel to the lack of remembrances of the current battles in the country. While Afghanistan has been mired in conflict and war for several decades now, there is little now to remember those killed in the most recent war in Afghanistan: Operation Enduring Freedom, mounted by the U.S. and foreign troops after Sept. 11, 2001. A transitional justice plan envisaged memorial sites and a war museum but these never came to fruition. So memories and remembrances exist in the form of anecdotes, but no one is buying the glass, as Khalid Hamidy tells me, to remember those who have been killed since 2001. As is the case in every city that has seen sustained bombings over the years, people in Kabul point out landmarks that have been bombed—once, twice, three times, more times than they can remember—and streets where it was once unsafe to travel. Portraits of Ahmed Shah Massoud—the resistance fighter from the Northern Alliance who was killed in 2001—hang from fortified public buildings that glisten with new paint. But plans to build a memorial to Massoud have been scuttled. “I believe they got to the stage of commissioning a sculpture in the roundabout that now bears his name, a public space, but it absolutely couldn’t get through,” Michael Semple, former Deputy to the EU Special Representative for Afghanistan, told the Revealer by Skype. Perhaps memorialization is easier when the battle lines were far clearer, as they were in the 1970s and 1980s: then it was the Communists and the Soviets against Afghan fighters, known as the mujahideen. It was a war supported by the U.S., a fight that was exalted in the foreign press. But the conflict that ensued—of former Afghan fighters battling with each other, the takeover by the Afghan Taliban and the post-9/11 war by the U.S. and allied forces to oust the Taliban government—doesn’t have that same degree of clarity. This is, perhaps, reflected in the lack of memorials to those killed since 2001, while there are markers to the wars predating it. The idea of memorialization may also emerge from the fact that the “war” has no clear winners. There is no ‘Mission Accomplished’ banner hanging on the streets of Afghanistan; many Afghans and foreigners question what the war achieved after all. That moment of clarity—as Ahmed puts it, the “perseverance” of the nation—has not arrived for Afghanistan as yet. This may be why the only memories that exist in Afghanistan relate to the war that was clearer in its purpose and achievements: the war against the Soviets. That seems to be the driving theme behind the Jihad Museum in Herat. The “Jihad Museum”—a brainchild of Ismail Khan, a former mujahideen commander and governor of Herat province—is hoping to preserve memories of the 1980s. But it doesn’t just serve as a memorial site; it’s also as a way to cement the reputation of men like Ismail Khan on the battlefield, and in Afghanistan’s governance. Tanks rest innocuously on the lawn of the museum. The exterior is designed like a shrine, the walls inlaid with traditional blue tiles inscribed with poetry. Diorama at Herat’s Jihad Museum. Photo by Saba Imtiaz. All rights reserved. It’s a memorial to the war that plagued Afghanistan for a decade, a war that only springs to memory when it pops up in a Tom Hanks movie or a rerun of a Rambo installment. At the museum, glass cases hold meticulously labeled “artifacts”: “.82 mm, anti-tank bullet, fire from shoulder, made in China”, “mortar bullet, fire from cannon, made in Soviet Union”, “P2 anti-tank mine, made in Pakistan”. The curator and co-founder of the museum Syed Abdul Wahab Qatali leads visitors through the exhibits. The glass cases give way to a gallery of portraits of martyrs, painted from images and memory and lit with fluorescent bulbs. Other rooms in the museum house stacks of images of mujahideen leaders, photos of those killed, and images of war commanders. Images of Russian soldiers presumed missing during the war hang on one wall. A visitor at the museum – a tall, bearded man wearing sunglasses – points to one of the black-and-white photos. “This is me,” he says. The man is Bakhretdin Chakimov—now known as Sheikh Abdullah—presumed dead for 33 years until he was discovered living in Herat last year. Abdullah says he is advising the museum on the Soviet-era remnants exhibited there, and wanders off to look at more war memorabilia with a group of visitors. Chakimov’s presence underscores why it is important to remember wars: it is not just for the sake of a country’s history, but also for personal stories as it fits into the backdrop of the war in the 1980s. But not everyone in Afghanistan has heard of the Jihad Museum’s attempts to memorialize the war, including Akbar Agha, a veteran of the Afghan jihad in the 1980s who went on to become a key Afghan Taliban leader. Agha says he did not believe in the idea of recording these events for posterity in the past, and is still vacillating on it now, even though he has recently authored his memoirs. The reluctance to record feats on the battlefield also came from the rank and file, Agha says. “A foreign journalist wanted to cover a mujahideen front and all of the mujahideen were very angry [at this],” he tells me, during an interview at his residence in Kabul. The commanders had to explain why the journalist was there. “People didn’t like it because they wanted to carry out pure jihad. If you start talking about it, you boast about it and take away from it [the spirit],” Agha said. The Hamidy family’s glass-blown tumblers and jars may be this evocative evidence. The traditions may have been muddled with the discourse on war, but Haji Sultan Hamidy’s store continues to occupy a space in Herat; and for those who take the aquamarine objects home, they serve as a subtle reminder of a war that once killed hundreds. Saba Imtiaz is a freelance journalist in Pakistan and the author of ‘Karachi, You’re Killing Me!’ (Random House India, 2014) and No Team of Angels (First Draft Publishing, forthcoming). She reports on politics, culture, human rights and religion and is currently working on a book about the conflict in Karachi. Her work is available on her website, http://sabaimtiaz.com and she can be contacted at saba.imtiaz@gmail.com.